Turkish Women's U19 National Team, coached by Suat Okyar, beat Bulgaria 3-1 in a friendly game. 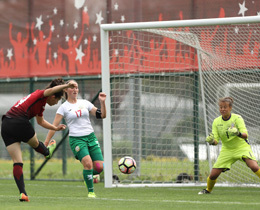 The match was played in Hasan Doğan National Team Camp and Education Facilities, Riva, İstanbul and Turkey's goals came from Kader Hançar (Min. 18 and 25) and Ece Türkoğlu (Min. 43) while Yuliana Aleksandrova (Min. 65) hit the target for Bulgaria. Women's U19s had beaten Bulgaria 5-2 in their first friendly game on 20 September 2017 Wednesday. Turkish Women's U19 National Team will participate 2017-18 UEFA U19 Women's European Championship Qualification Round which will be held in Hungary between 18-24 October 2017.